Now The Details: The Toronto Star and "Chequebook Journalism": Was it worth it? The Toronto Star and "Chequebook Journalism": Was it worth it? The Toronto Star has been miles ahead on the Rob Ford story. In effect, this story belongs to the Star, its amazing investigative reporters and to the management who have had the journalists' backs throughout. An interesting wrinkle in this otherwise, truly heroic tale of journalistic daring and intrigue, has been the infamous Ford videos. The last video to be made public shows the mayor in the midst of a powerful rant against someone (we aren't told) and under what circumstances (we don't know). There is much about it we don't know and Ford will not comment. It is disturbing. The Star purchased this video for $5000. In a North American news culture that denounces "chequebook journalism", this elicited a somewhat defensive justification from the Star's Public Editor, Kathy English. (Full disclosure: Kathy English and I are co-chairs of the program committee of the Canadian Journalism Foundation). Her column also provoked consternation among some very thoughtful journalists. They expressed concerns about the implications of paying for news and whether the role of the public editor has come too close to public relations. 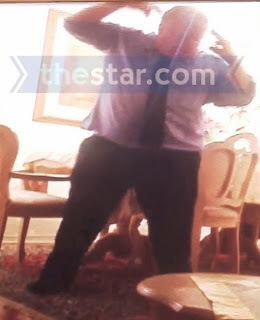 Suppose someone offered a cell phone video of the publisher of the Toronto Star in a drunken rant using obscene language about a public figure (say [Prime Minister] Stephen Harper). This is the person in charge of the largest daily newspaper in the country, a newspaper whose editorial opinion has been consistently critical of the Harper government. Would it be “chequebook journalism” if some media outlet paid $5,000 for that video and then aired it? Just asking. rival in an unfavorable light. this more than it needs to know about the publisher. I think the Star was (mostly) right to pay for that video. We live in different times now, and social media has made that difference. With great respect, this isn't about (the Star's publisher John) Cruickshank or (Mayor) Ford, and it's not about social media. It is about technology. Cellphone video can be shot anywhere someone lets down his guard through naïveté, inattention, inebriation or trust of those in the room. The unscrupulous and mendacious can capture images of unguarded behaviour and then take them to the marketplace. Buying such material isn't chequebook journalism, or journalism at all. It's about legitimizing (and maybe encouraging) such invasions and saying that if you're big enough or notorious enough, no place is private, no act not fair game. Would The Star have bought such a video involving another public figure--say if Nigel Wright was caught on cellphone sharing with friends what took place in conversations with the Prime Minister--or is the public interest slider just set for Mr Ford? Given all we've learned about Mr Ford's behaviour, was this drunken rant such a huge advance on the story that it rated a novel policy and the framework of justification that's been erected around it? Would similar video captured on a nanny cam be equally attractive? How do editors vet for entrapment--or do they? Would another newspaper have bought this material? The Star has been superb in its brave and illuminating investigative work in the last few years and on this story. I'm very sorry it bought this material.